Operating Manual for Spaceship Earth. New York: Simon and Schuster, 1969. 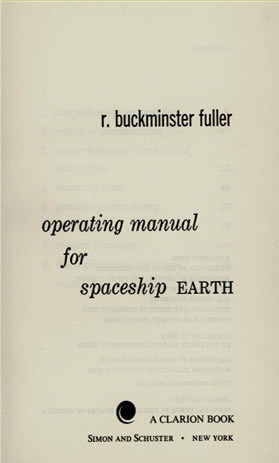 Written in the same year that man first landed on the moon, Operating Manual for Spaceship Earth addresses how man can live on Earth successfully. Fuller, best known for the invention of the geodesic dome, encouraged ecological stewardship of the earth's resources, especially energy. He called for a rethinking of politics and wealth to best sustain all the passengers of "Spaceship Earth."